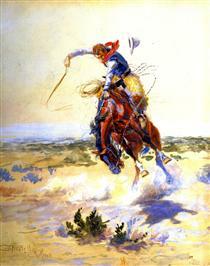 Charles Marion Russell (March 19, 1864 – October 24, 1926), also known as C. M. Russell, Charlie Russell, and "Kid" Russell, was an artist of the Old American West. 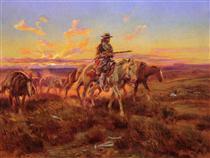 Russell created more than 2,000 paintings of cowboys, Indians, and landscapes set in the Western United States and in Alberta, Canada, in addition to bronze sculptures. 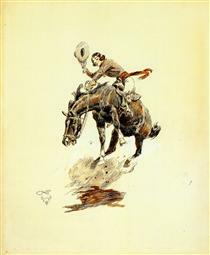 Known as 'the cowboy artist', Russell was also a storyteller and author. The C. M. Russell Museum Complex located in Great Falls, Montana, houses more than 2,000 Russell artworks, personal objects, and artifacts. Other major collections are held at the Montana Historical Society in Helena, Montana, the Buffalo Bill Center of the West in Cody, Wyoming, the Amon Carter Museum of American Art in Fort Worth, Texas, and the Sid Richardson Museum in Fort Worth, Texas. Russell's mural titled Lewis and Clark Meeting the Flathead Indians hangs in the state capitol building in Helena, Montana. 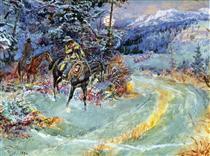 Russell's 1918 painting Piegans sold for $5.6 million at a 2005 auction. Art was always a part of Russell's life. Growing up in Missouri, he drew sketches and made clay figures of animals. Russell had an intense interest in the wild west and would spend hours reading about it. Russell would watch explorers and fur traders who frequently came through Missouri. Russell learned to ride horses at Hazel Dell Farm near Jerseyville, Illinois, on a famous Civil War horse named Great Britain. Russell's instructor was Col. William H. Fulkerson, who had married into the Russell family. 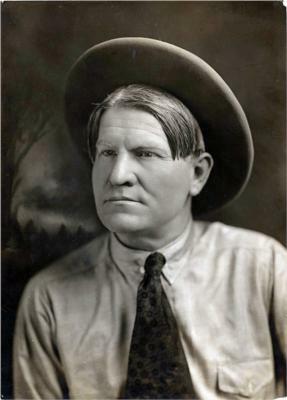 At the age of sixteen, Russell left school and went to Montana to work on a sheep ranch. Russell came to Montana in 1880 at the age of 16. After an unsuccessful stint working on a sheep ranch, he found work with a hunter and trapper turned rancher named Jake Hoover, who owned a ranch in the Judith Basin, and from whom Russell learned much about the ways of the west. The two men remained lifelong friends. After a brief visit to his family in 1882, he returned to Montana, where he remained for the rest of his life. 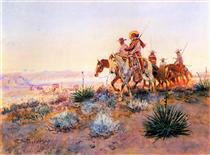 He worked as a cowboy for a number of outfits, and documented the harsh winter of 1886–1887 in a number of watercolors. Russell was working on the O-H Ranch in the Judith Basin of Central Montana at the time, when the ranch foreman received a letter from the owner, asking how the cattle herd had weathered the winter. Instead of a letter, the ranch foreman sent a postcard-sized watercolor Russell had painted of gaunt steer being watched by wolves under a gray winter sky. The ranch owner showed the postcard to friends and business acquaintances and eventually displayed it in a shop window in Helena, Montana. After this, work began to come steadily to the artist. Russell's caption on the sketch, Waiting for a Chinook, became the title of the drawing, and Russell later created a more detailed version which is one of his best-known works. 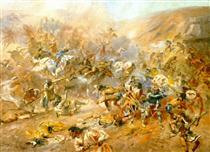 Beginning in 1888, Russell spent a period living with the Blood Indians, a branch of the Blackfeet nation. 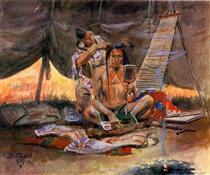 It is believed that much of his intimate knowledge of Native American culture came from this period. 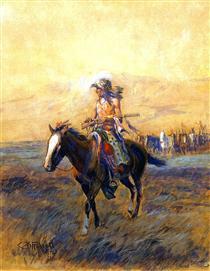 Upon returning to white culture in 1889, he found the Judith Basin filling up with settlers, so he worked in more open places for a couple of years before settling in the area of Great Falls, Montana, in 1892, in an attempt to make a living as a full-time artist.